The World Championships 2015 will take place in Herning (DK). Herning hosted the World Championships 2003 as well. 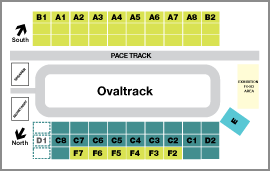 The venue which has a new oval track is regarded by many as Europe´s best location for a major international horse event like the World Championships. The organization is in the hands of Nordiska Islandshest Forbundet (NIF), a Nordic association made up by the national Icelandic horse associations in Denmark, Faroe Islands, Finland, Iceland, Norway and Sweden. A contract between DI (Denmark) and FEIF as well the required contract between the six Nordic countries for cooperation, were signed during the summer of 2012. You can buy numbered seat tickets and tickets for standing areas here at SPORTI. For questions about tickets, please contact ticket@vm2015.com or phone (+45) 30140102 (open Monday, Wednesday and Thursday 10.00-14.00).